The problems associated with birds of prey trying to breed on grouse moors are all too familiar. So when a marsh harrier nest was found on Denton Moor, North Yorkshire, it was initially cause for celebration. Until the nest was found empty. RSPB Investigations Officer Howard Jones is in search of answers. Last weekend saw thousands of people come together for Hen Harrier Day, a series of events across the country co-ordinated to raise awareness for the beleaguered plight of the hen harrier and its continued struggles to breed in the UK uplands due to illegal persecution. The plight of the hen harrier and its conflict with land managed for driven grouse shooting is a well trodden story. During 2017, there were just three successful nests from seven breeding attempts in England, despite huge areas of suitable habitat. There were no successful nests on grouse moors. As such, it was met with great interest by our team when, in May this year, we managed to pin down a breeding pair of marsh harriers on a driven grouse moor in North Yorkshire. Denton Moor has the famous Ilkley Moor to the south and sits at the southern end of the Nidderdale AONB which has long running troubles with raptor persecution. North Yorkshire has now firmly taken a grip over the title for ‘Worst County in England for raptor persecution’ as confirmed incidents occur with depressing regularity. 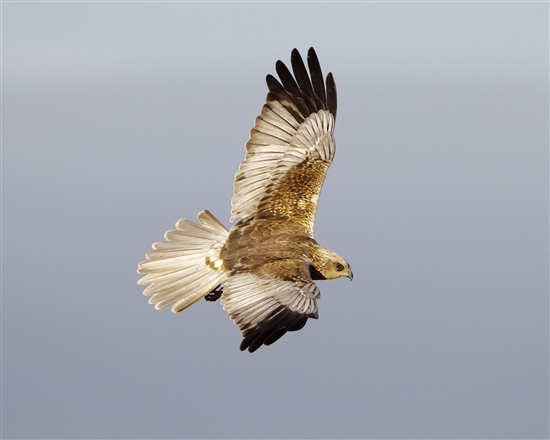 During the last ten years, within five miles of the marsh harrier nesting attempt, we know of at least nine red kites which have been illegally poisoned and a further three shot. The marsh harrier is normally associated with the lowlands of south-east England and not a typical breeder in the uplands. Formerly extinct in the UK due to human persecution, the species had further problems with agricultural pesticides in the food chain and by 1971 there was just one breeding pair. Encouragingly, it has since rallied to around 400 pairs. In lowland North Yorkshire, there have been a few breeding pairs in recent years, but you really have to wade through the history books to go back to when the species was last recorded breeding in the uplands of the county. Perhaps this wasn't the harrier species you'd expect, but this was still a harrier trying to breed on a driven grouse moor. In May 2017 I visited the nest site with a colleague under the authority of a Schedule 1 license, locating the nest after the female bird came off. The nest was checked and it was confirmed to contain five eggs. A camera was installed to monitor the nest, which was no mean feat as my colleague was in the midst of a developing a severe fever during the installation of the equipment! We then moved away from the nest site and watched the female return to the nest. We returned on the 19 May, and though there were a pair of marsh harriers in the general area, there was no activity at the nest site. When checked, we found the nest was empty with all the eggs gone. What had gone on? Back in the office, we anxiously reviewed the video footage. Initially, the pair were displaying typical marsh harrier nesting behaviour and things seemed to be progressing well. Rather annoyingly the poor weather moved the vegetation slightly and partially obscured the camera image before things took a turn for the worse and we saw exactly what had gone on - and why the nest had failed. On 17 May we started to see a disturbing series of events with regular human activity at and around the nest site. At 12.40 hours on that day, a bang was heard off camera and the female bird came off the nest alarm calling. Another bang followed the revving of a vehicle and a voice shouting. At 12.42, an armed individual appeared on camera walking to the nest, stands over the nest, then walks back in the direction he came from. The bird returns to the nest, however the unwanted attention had only just begun. At 13.56 hours, the female left the nest again, this time immediately followed by a volley of four gunshots. After a few moments later two armed men appear on camera with their faces covered. This clearly appeared to be an attempt to shoot the female bird leaving the nest. They continued walking in the direction of where the female had flown, going out of view of the camera, before shortly returning and going to the nest. One man bends down at the nest and as he leaves a white object, believed to be at least one marsh harrier egg, can be seen in his hand. 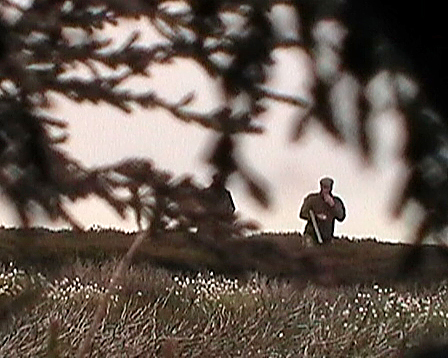 Two armed men leaving the marsh harrier nest, male on the right believed to be carrying at least one marsh harrier egg. This shocking video evidence was passed onto North Yorkshire police, and we are grateful for the efforts of Wildlife Crime Officer PC Bill Hickson, and the support from the Rural Taskforce, with the investigation of this matter. North Yorkshire Police clearly recognise the continuing problem of raptor persecution in their force area and are making to determined efforts to investigate such cases. Within the bigger picture, this is yet further evidence, were it needed, as to what happens to harriers trying to breed on a driven grouse moor. This continues to damage the reputation of all shooting. The status quo is unacceptable. Introducing measures such as vicarious liability, already in place in Scotland, and the licensing of driven grouse moor estates is so obviously needed to create more accountability within the shooting industry. This needs to be coupled with using every tool currently available in the box, whether it is revoking firearm certificates from offenders, custodial sentences in the worst cases or withdrawing subsidies from estates in receipt of rural payments that commit wildlife crime. The people on our video footage may have been feeling pretty smug believing their criminal actions had been unseen - this needs to change. We understand the police have interviewed two people to date, but getting a positive identification on those shown in the video footage, or any other related information, would help a great deal towards the ultimate aim of getting a prosecution in court. This is where you may be able to help and all calls will be treated in confidence. If you have any information in relation to this incident then please get in touch with North Yorkshire police on 101 quoting the job reference 165 27 05 2017 or call the RSPB Investigations team confidentially on 01767 693474.